Fender Japan ST62 LEFTY Reissue. Made in Japan. Year 1993. Bighead stock. Rosewood fingerboard. Faded Artic White finished. Serial no: MIJ N027xxx. Fret life 9/10; Condition 9/10. Comes with Gator Stand-A-Case hardshell case. Fender Japan ST57 Reissue. Crafted in Japan. Year 1997. Maple fingerboard. Original parts. Black finished. Serial no: CIJ O051xxx. Fret life 8/10; Condition 9/10. Add RM150 for Gator Stand-A-Case hardshell case. Fender Japan Mustang. Made in Japan. Year 1984. Fender Jaguar. Made in Japan. Year 1999-2002. Rare matching headstock. A tiny paint peel at the back of body. Fender Telecaster. Year 1984-1986. Made in Japan. Rosewood fingerboard. MOD with DiMarzio Twang King neck pickup. Condition 9/10. Fender Stratocaster ST54' reissue. Crafted in Japan. Year 2004-2005. Maple fingerboard. V-neck grip. Feel the Twang tone! 2 tone finished. Condition 9/10. Fender American Standard Stratocaster. Year 1998.Made in USA. Rosewood fingerboard. All original parts.Condition 9/10. 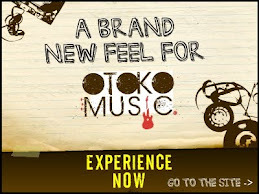 Come with Ori Fender Hardcase. Fender Japan ST57. Made in Japan. Year 1984. E-series model. MOD with wood pickguard. Metallic Candy red finished. Fret life 8/10. Condition 9/10. Fender Jazz Bass. Made in Japan. Year 1994. Vintage look bass. Nice tone. Condition 8/10. Fender Jag-Stang. Made in Japan. Year 1995-1996. 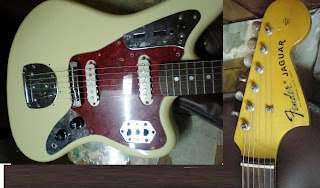 Combination of Jaguar and Mustang with the design from Kurt Cobain (Nirvana). SONIC BLUE finishing. Condition 8/10. Fender Japan Stratocaster Standard. Made in Japan. Year 1993. 1 pc Maple neck + board. Condition 9/10. Fender Japan Jaguar. Crafted in Japan.Year 1997-2000. Fender STRAT PLUS. Made in USA. Year 1989-1990. Fender Gold Lace Sensor Pickups. Locking tuners, Wilkinson roller nut, 1pc Maple neck. Fender TBX tone control. Rare color, Pewter finished. Come with Fender Tweet hardcase. Condition new MINT! Fender American Standard. Made in USA. Year 2004. Been MOD with SCALLOP fingerboard to play like Malmsteen! Candy red finished. Comes with original Fender hardcase. Fender Stratocaster Highway 1. Made in America. c/w gig bag + Full accessories. Fender Japan Precission bass. Made in Japan. Year 1985. Fender Vintage Jazz Bass '62 reissue. Made in USA. Year 1995. Alder body. C-profile maple neck with rosewood fretboard. Reversed tuning "F" machine head. Comes with original Tweed hard case. Condition 9/10. Fender Japan ST72 Reissue. Made in Japan. Year 1985. Bighead stock. Original hardware. Rosewood fingerboard. Faded Artic White finished. Serial no: MIJ A005xxx. Fret life 9/10; Condition 8/10. Fender America '57 Reissue. Made in USA. Year 2000. 1 pc V Profile Maple fingerboard. Warm and super clear tone! Stock Parts. Original Fender Tweed Hardcase included. Condition NEAR MINT! VIEW TO BELIEVE! Fender Japan ST57 reissue. Made in Japan. Year 1993-94. Stock parts. Maple fingerboard. V-shape neck. Fender Stratocaster Eric Clapton BLACKIE Signature model. Made in USA. Year 2003. 1pc maple fretboard. Fender TBX tone control. Noiseless pickups. Comes with Original Fender Tweed case. Ding and scratches at the back of body.Condition 8/10; Fret 8/10. 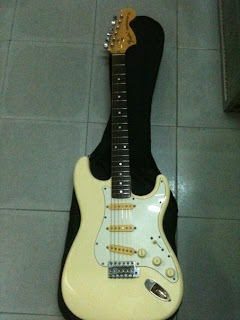 Fender Eric Johnson Signature.ade in USA. Year 2006. 2-color Sunburst finished. 2-pc Alder body. Soft "V" neck profile.One-pc Quatersawn Maple neck. Comfortable 21 Medium Jumbo Frets. 3 x Special design EJ pickups w/countersunk mouting screws. Designed by Johnson himself with his own personal features and preferences. Comes with EJ Fender Hardcase. Condition MINT!!! Just like NEW! Fender American Vintage 70s reissue. Made in USA. Year 2006. Ash body. Rosewood fretboard. Natural finished. 3 Vintage-stle single-coil Strat pickups with Alnico V Magnets. Comes with Fender "vintage" hardcase. Fender Japan ST62 Reissue. Made in Japan. Year 1994-95. Rosewood fingerboard with bottom truss rod adjustable. Finished in 3-tone color. Condition 9/10. Fender Japan ST57 Reissue. Made in Japan. Year 1985. Stock hardware. Maple fingerboard. Candy Red finished. Serial no: MIJ E953xxx. Condition 8/10; Fret 8/10. Fender Telecaster TL72. Made in Japan. Year 1984-1986. Natural finished Tele, 1pc Maple neck. Screws and knob will be replace. Seasoned pickups and tone! Condition 9/10. Fender Jazz Bass. Made in Japan. Year 1990-91. Stock parts. Gigbag included. Condition 9/10. Fender Stratocaster Eric Clapton Signature model. Made in USA, Built in Year 1989. Original Lace sensor active pups. 1pc Maple neck. All stock parts! Come with Ori Fender Tweed hardcase. Condition 9/10. Fender Jazz Master LEFTY. Made in Japan. Year 1995-1996. RARE lefty Jazz Master. Show room unit in BRAND NEW condition. Stickers still attached! 2 tone sunburst finished. Fender JazzMaster JM66. Year 1997-2000. Made in Japan. Fender Japan Stratocaster ST67 '68 Reissue. Crafted in Japan. Alder body. Worn fretboard. "F" Hendrix Woodstock Style in vintage white. Schaller vintage "F" machine heads. Condition 9/10. Fender Telecaster Custom. Crafted in Japan. Year 2006. Original Fender humbucker pup. MOD with new Pearloid pickguard, DiMarzio bridge pickups. Added on Bigsby B5 Fender Vibrato Kit. Replaced with Gold metal knobs. Black finished. Fender Japan ST72 Reissue. Made in Japan. Year 1993. Stock hardware. Rosewood fretboard. Faded Vintage White finished. Serial no: MIJ Q011xxx. Condition 9/10; Fret 9/10. Optional to add RM150 for Gator Stand-A-Case hardshell case. Fender Telecaster American Standard. Made in USA. Year 1996. Rosewood fingerboard. Comes with original Fender hardcase. Excellent condition! 50th anniversary model. Fret life 80%. Condition 9/10. Fender USA Blackie. Year 1989. Made in USA. Eric Clapton model, equipped with 3 x Lace Sensor pups. 1pc maple fingerboard. Comes with hardcase. Condition 9/10. Price: SOLD to Shuhaimee from Kajang @ 12DEC12. Fender Stratocaster America Standard. Made in USA. Year 1996. 40th Anniversary. 1pc Maple neck and fingerboard. Excellent clean tone with twang! Condition 9/10. All original parts. Saddle cover and Tremolo arm included. Comes with Original Fender hardcase. Fender Jaguar Vintage reissue. Made in USA. Year 2006. Stock parts. Comes with String mute and Saddle cover. Come with Fender OHSC. Fender Jeff Beck Stratocaster Signature. Made in USA. Year 2006. Alder body. Thinner "C" Maple neck with Rosewood fretboard. 3 x Dual-Coil Ceramic Noiseless Pickup. LSR Roller Nut. Deluxe Cast/Sealed Locking Tuning Machines. Olympic White finished. Fender Tweed hardcase included. Condition MINT just like new!!! Fender Stevie Ray Vaughan Stratocaster. Made in USA. Year 2006. Alder Body. Maple "Oval" neck shape. Pau Ferro fretboard with 21 frets. 3 x Texas Special™ Single-Coil Bridge Pickup. Left handed American Vintage Tremolo. Come with Fender Tweed Case. Fender Stratocaster Eric Clapton "Blackie" Made in USA. Year 2002. 2nd Generation of Blackie. Alder body, 1pcs maple neck + Fretboard. Fender Active Noiseless pickups. Original Fender Hardcase. Condition 9/10. Fender Japan ST62 Reissue. Made in Japan. Year 1993-94. Rosewood fingerboard with bottom truss rod adjustable. Finished in Black. S/N: Q021904. Condition 9/10. 1pc Maple neck. Vintage condition. Stock parts. Fender Japan ST72. Crafted in Japan. Year 1999-2002. Bighead stock. 1 pc Maple fingerboard. Full Gold hardware. Fret life 9/10. Condition 9/10. Fender America '57 Reissue. Made in USA. Year 1995. JB-40. Made in Japan. Year 1988. Rare HYBRID of Jazz + P bass. Condition 9/10. Fender Jazz Bass. Made in Japan. Year 1996. Candy Red finished. Condition MINT! RARE lefty Jazz Master. Arctic White finished. Condition 9/10. Fender Japan Telecaster Custom. Year 1984-1986. Made in Japan. Fender JazzMaster JM66. Made in Japan. Year 1995-86. Seasoned pickups. Tremolo arm included. Condition 9/10. Fender Japan JazzBass JB-40. Made in Japan. Year 1993-94. Warm and punchy tone. Condition 9/10. Fender Stratocaster America Standard. Made in USA. Year '95. Rosewood fingerboard. Vintage white (look aged). Great condition hardware. Hardcase included. Condition 9/10. Fender Precision Bass PB57-US reissue. Made in Japan. Year 1988-1989. Maple fingerboard. Black finished. Vintage looks alike. Condition 9/10. Fender Japan Jaguar. Crafted in Japan.Year 1999-2002. Stock parts. C/W gigbag. CIJ Serial P.
Fender Precision Bass PB57. Crafted in Japan. Year 1999-2002. Maple fingerboard. 2 tone color finished. Fender Japan ST62. Made in Japan. Year 1994-1995. 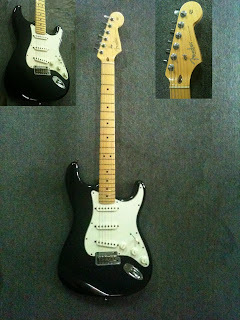 Fender Japan Stratocaster. Made in Japan. Year 1993-94. Candy red finished. Rosewood with bottom truss rod adjustable. Condition 9/10. Fender Stratocaster ST72. Made in Japan. Year 2006. Big head stock! 1pc Maple Neck. Black finished. Very mint condition! 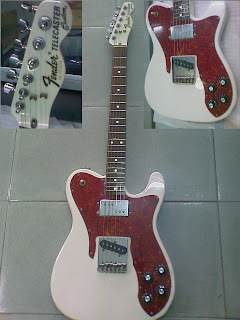 Fender Telecaster American Series. Made in USA. Year 2007-2008.Roadworn body. 1piece maple fingerboard. Condition 8/10. 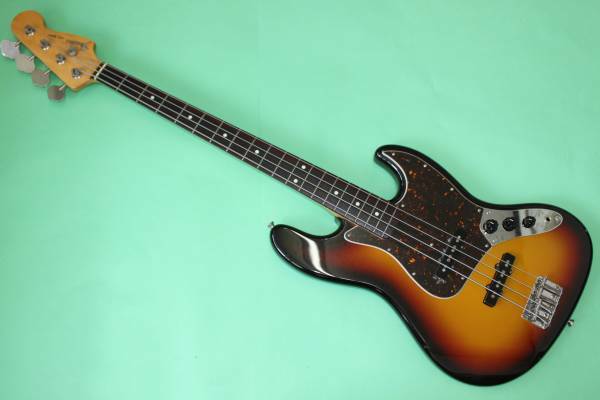 Fender Japan Jazz Bass LE. Crafted in Japan. Year 1997-2000. Limited edition of JazzBass. With Maple fingerboard. Dark blue finished. RARE!!! Condition near MINT!!! Fender Jazz Bass JB62-US. Crafted in Japan. Year 1999-02. American vintage pickups. Vintage white finished. Condition 9/10. Fender Stratocaster 40th Annivesary. Year 1994. Rare & Limited Edition! Condition Mint! Fender Japan Vintage Stratocaster Standard. Made in Japan. Year 1984-1987. Discontinued model E-Series Strat. All stocked parts. O-series. Gigbag included. Condition 9/10. Maple fingerboard with C-neck grip. Candy red finished. Paint peel on the 2nd fret of fingerboard. Serial M007xxx. Condition 9/10. Fender Mustang MG73. Crafted in Japan. Rare axe! Bottom truss-rod. All original parts! MINT! Just like new! FREE HARDCASE! Fender Mustang. Yellow Cream. MIJ. Fender Telecaster. Made in Japan. Year 1993-1994. 1 piece maple fingerboard. Condition 9/10. Fender Precission 4-strings Bass. Made in Japan. Year 1984-1986. Serial no E608253. Super rare bass! RARE!!! Price: SOLD to the same Danish, Carsten. Fender Precission 4-strings Bass. Made in Japan. Year 1993-94. Knobs had been changed. Bottom truss rod. 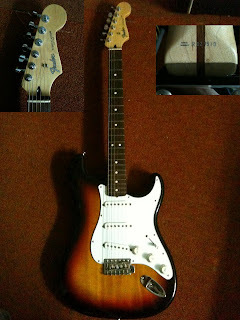 Fender Stratocaster American Series. Year 1993. Made in USA. 1pc Maple fingerboard. Tweed sound is so sweet! Comes with Fender Hardcase. Condition 9/10. Fender Stratocaster 54' Reissue. Made in Japan. Year 1994-95. YES! Another Jagstang in da house! 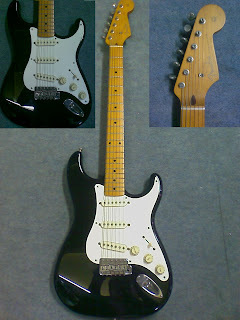 Fender Japan Stratocaster ST75. Made in Japan. Year 84-86. Floyd rose equipped rare Strat. Clean Fender tone with gold hardware. Conditionn 8/10. Fender Talon. Made in Japan. Year 1991-92. Reverse headstock, Floyd Rose tremelo. Rare model!!! MOD with DiMarzio brige pickup. Fender Jazz Bass JB62-US. Crafted in Japan. Year 2001-2002. Alder body, 20frets with Rosewood fingerboard. Serial number start with Q. Condition 9/10. Fender Jaguar JG66. Crafted in Japan. Year 1997-2000. 3-Tones finished. Condition 9/10. Fender Stratocaster America Standard. Made in USA. Year 2007. Aged parts with vintage Fender bridge saddle. 1pc Maple neck and fingerboard. Excellent clean tone with twang! Condition 9/10. Fender Jazz Bass JB62-US. Made in Japan. Year 1993-1994. Alder body, 20frets with Rosewood fingerboard. Condition 9/10. Fender Stratorcaster ST72. Made in Japan. Year 1984-1987. Big head stock! 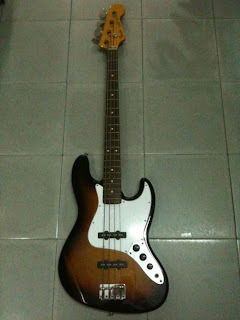 Price: SOLD to Brandon from Klang On 18Feb11. Fender Telecaster. TL62-SSV. Crafted in Japan. NEW from Fender. Silver Metallic finished. Fender Floyd Rose Stratocaster Special HSS. Year 1986-1987 ,Made in Japan. RARE Fender Strat with original Fender Floyd Rose Tremolo.Condition 9/10. Mint condition! Fender Jazz Bass. JB62-US. Made in Japan. Made in Japan. Top truss rod. Condition 8/10. Some Dings. Serial No G003xxx. Fender Stratocaster 57-TX. Year 2005-2006. Crafted in Japan. Bottom truss rod.Superb MINT!!! 99% NEW!!! 1% of usage been seen!!! Price: SOLD to Gaby from ChanWa Seremban. Fender Stratocaster Standard. Year 2004-2005. Made in Japan. Top truss rod.Condition 10/10. Mint condition! Fender Stratocaster LEFTY. ST-72. Made in Japan. Year 1989-1990. Its rare in LEFT HANDED! Fender Jazz Bass. JB62-VSP. Made in Japan. 2pc Alder Body. 20 frets with rosewood fingerboard and Maple neck. Condition 9/10. Fender Jaguar JG66. Made in Japan. Year 1993-94. Fender JazzMaster. Made in Japan. Year 1993-1994. This is a very rare offset guitars with matching headstock! All parts are original. Arm bar included. Condition: 9/10. Fender Stratocaster USA '62 Reissue. Made in USA. Year 1993. The reissue model of the vintage Fender Strat, Fabulous tone, Fret's life still 80% left. Candy red finishing. Comes with Original Fender Vintage Hardcase. Price: SOLD to Rocky from Siam. Fender Jag-Stang. CIJ. O098973. Year 1997-2000. 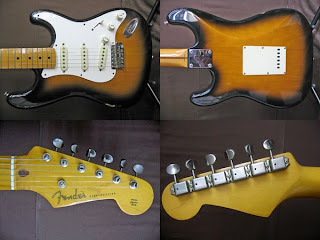 Fender Japan Vintage Stratocaster Standard. Made in Japan. Year 1984-1987. Sunburst color. Fine scratches. 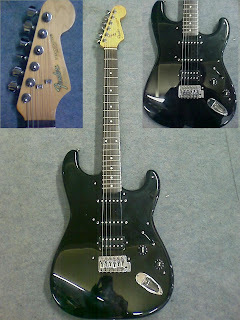 Discontinued model E-Series Strat. Fender Jazz Bass. Made in Japan. Year 2003. Top Truss Rod. Condition MINT! Fender Stratocaster ST-314. Year 1984-1987. Made in Japan. Top truss rod.Condition 8/10. Some Dings. Fender US Stratocaster 50th Anniversary. Year 1995-1996 by Corona. Made in America. Maple fingerboard. Year 1984-1987 ,Made in Japan. Equipped with 57's bridge tremolo. Maple fretboard. Bottom Truss rod. Extremely superb Texas pickups build. No different with a Fender USA with the warmest tone ever.Condition 9/10. Minor dings. Fender Stratocaster ST-57 TX. Made in Japan. Year 1993-1994, equipped with 57's bridge tremolo. Maple fretboard. Thanks to Mr Fahmi from Rembau! Fender Jaguar. Arctic White.. Made in Japan. Serial No O0092xx.Big headstock. Fender Telecaster Custom. Black in color. Year 1997-2000. Crafted in Japan. Fender Stratocaster Standard. Olympic White. Made in America. Year 2001-2002. Comes with Hardcase. Price: [SOLD]Thanks to En. Noordin from Seremban! Fender Jaguar. Vintage Sunburst. Crafted in Japan. Seymour Duncan hambucker pickup. 70s Big headstock. Condition 9.5/10. Serial no R077609. Fender Stratocaster ST62-TX.~Black. Crafted in Japan. Condition 9/10. how much did u sell the fender telecustom? keep urself update on the blog~ cheers! hey do you have any fender thinline coming in anytime soon? and what would the pricing be like? hi i have a fender squier stratocastor made in korea was originally bought in late 70's and was white , arebthese sought after i don't know much about them ?? 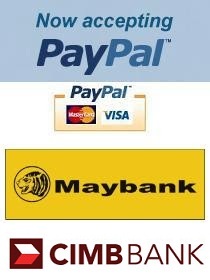 Korean mostly will go to around RM700++ depends on condition. Can i asked a question do you still sold this guitar? Very appriciated the service of the shop. I just surveying the fender jaguar sunburst guitar whether is there any stock or not. 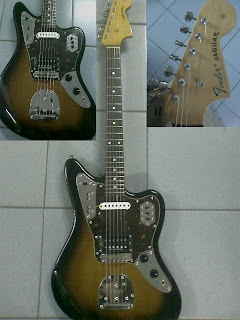 Maybe next time, do the request for ordering fender jaguar sunburst guitar. 1 Euro = RM 4.10 | 1 USD = RM3.40. We ship worldwide. Drop me a mail if you do have any inquiry. a friend of mine is looking for used fender J-bass. 4 or 5 strings prefrebly made in US or Jap.. u can email me at syazwara@gmail.com if u have any news. Arian, i will email you if there is another 4 strings Fender Jbass arrive. Most likely Japan made. Shukri, i will try to find you a black Fender JM. hi there, email me if there any 5 strings fender guitar bass made in USA or Japan arrived to your shop. Thanks man..
do you have 4strings fender p bass? 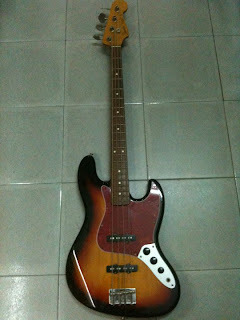 Yes, i just upload 1 Fender P bass with maple fretboard. Check it out..
Where is the Squier Fender Tele Jim Root Signature model made from? If its a Japanese made model i can get it, but if its a Indon or China, hard for me to source it cause the price is almost same as the brand new guitar. how much the japan made model of squier fender tele jim root price? Squire from 1990 is only made in Korea, China or indonesia, there is no more Japan made Squier in the market now. If Jim Root Squier is introduce from Year 2000 and it will be made in China or Indonesia. If Fender Jim Root model is mostly made in Mexico. Sorry that i don't have Jim Root Squier. I only have Japan made Squier in Butterscotch finished. 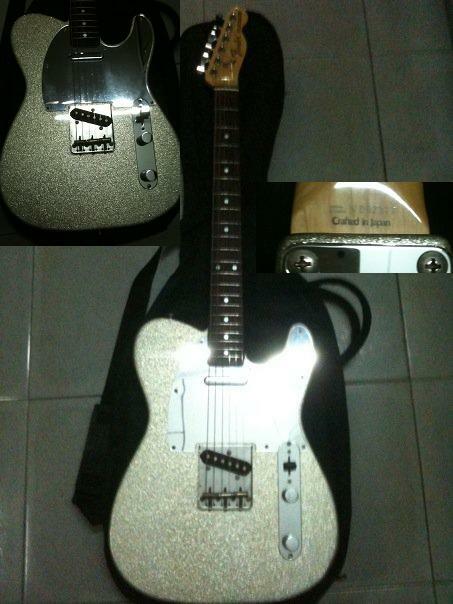 Hey, I am selling my mij fender telecaster vintage the '52 series.. The price could be RM2000-RM1500.. Anyone?? hey, can i see it? some picture? I'm new at this, where is a good place to start with 3800 performance mods? Hi there, what do you mean by the 3800 mods? Do you got any squier mustang or jaguar? Most of them is MIJ right?gassing it right now. Hi Dink, sorry i only have the Squier MIJ Telecaster. So far haven't come across Squier Mustang or Jaguar. Dink, you can check out at the blog in the Squier category. Hi I have a Pyramid Electric Guitar and Pyramid G10 Amplifier complete with picks, tuner, chords, strap and an extra Kustom KGA10FX 10-watt amplifier with effects for sale. I'll be letting the whole lot off for RM400. It's a perfect guitar for learners and is in very good condition. I treat my guitars as if they were children. Please if interested you can reach me on 0146415507. So sorry we dont buy used guitars. We just selling. just asking, can do any swap here? Hi Timothy, sorry that we dont swap guitars..
Hi, do you sell fender thinline MIJ? Hi Lim, Still trying to get some Thinline MIJ but thinline MIJ is so hard to get and quite expensive. Trying my best. hi, do you have any 22 fret fender..maple neck? 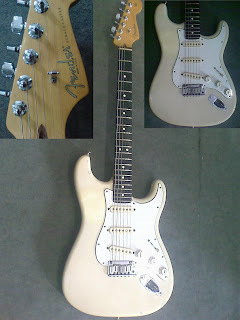 Hi could you tell me what the price would be for 1996 (50th) anniversary fender japan 67/68 reissue in Olympic / vintage white (Hendrix at Woodstock model) do you get these in stock ever? Close to mint condition ? Where else can i find fender jazz master in malaysia? Currently i have a Yamaha mod fretless bass. 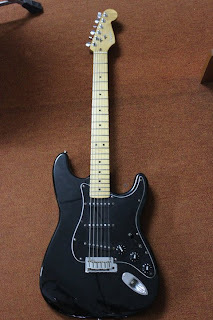 Hi Bro, Im looking for Fender 70's Japan Ash wood body and maple neck. Do you have stock available? I have trip to KL in Feb perhaps will pop by to your place. Pls advise on the availabilty ok. Many thanks & look forward to hear from you soon. I have a Fender Japan Ash wood body but with rosewood fingerboard. you interested? hi is the fender standard strat mij still available? Yes bro. still available. Got 2 more choices for you to choose! Hi do you have a left handed jaguar MIM ? im choosing MIM because its cheap XD. 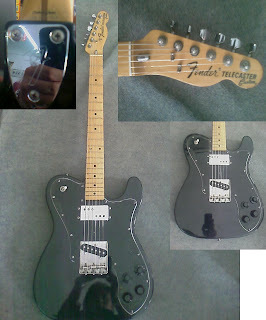 Hi do you still have the Fender Telecustom Black?